You would be forgiven for thinking these crisps are beetroot. In fact they are a purple potato called purple majesty. High in flavonoids they have many of the same antioxidants as blueberries and their deep purple colour makes an interesting addition to the dinner table. 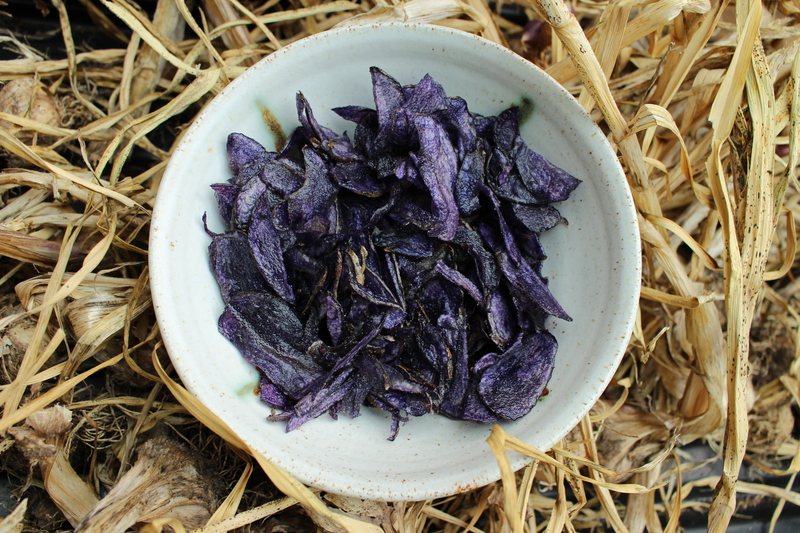 In the Kitchen: I’ve tried roasting and making crisps with good results but I have to admit I can’t quite bring myself to make mash, especially as when mashed they seem to come out a deep lilac. They are floury rather than waxy but have quite a high water content. Plant health and yield: Described as a maincrop but the foliage died down long before even the first earlies. I harvested in late Jun, a couple of weeks after foliage had died down. Yield was not high, most tubers were between quail egg and small hens egg size and one baker standing out from the crowd. Other than that the tubers were quite healthy with some minor slug damage.